On Jan. 13, 2017, Duke Energy Foundation and United Way Suncoast began a partnership committed to the development and sustainability south St. Petersburg’s Campbell Park Neighborhood. There was a need for a one-stop resource center, collaborating with community partners, to provide empowerment services for families working towards long-term financial stability. Tax preparation that is completely free and find every deduction you’re entitled to. By appointment only. Learn how to achieve financial freedom, set up savings goals, track expenses, and develop healthy financial habits to become self-sufficient. Career training and education opportunities in employment sectors that provide sustainable living wages and long-term financial stability. Free legal services for those in need: housing/foreclosures, family law, wills, debt collections, bankruptcy, expungements and more (all non-criminal cases). Assist to stabilize entire family; cover immediate basic needs, set up short/long-term goals, develop new skills and build a support system for each other. Emergency housing and domestic violence guidance services are available. Open to students and adults. Work on your resume with a coach, search and apply for employment, scholarships and other educational programs, school projects and homework. Computer literacy courses are offered twice a week. Open daily. Learn about financing home improvements and repairs, lowering your utility bills, or expanding your small contractor business’s reach. Provides services in the areas of landlord tenant issues, federally-subsidized housing, Homeownership, Consumer Issues, and Family Law. Lead agent for the center by providing workspace for on-site staff and for our organized community partnership and programming. Ensure healthy eating initiative is active in Campbell Park Elementary School and John Hopkins Middle School. 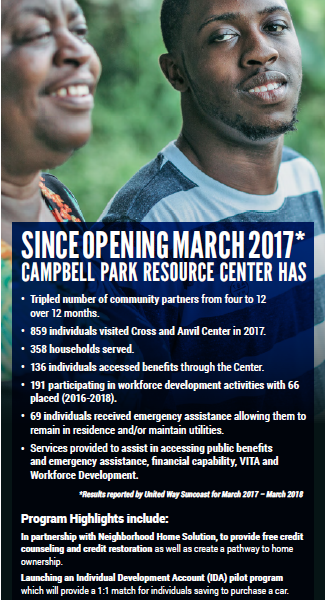 Has designated Campbell Park Resource Center as the exclusive workforce and resource center for parents that live in the South St. Petersburg Area. Provide assistance in the areas of workforce development, financial coaching, and computer training. Provides workforce development and training for ex-offenders. The program includes personal development, resume building, soft skills, and interviewing techniques. On-site provider for workforce development and career training. They provide resume writing, and basic computer skills trainings twice a week. Provide emergency housing, domestic violence advocacy counseling, and food distribution resources. On-site provider for case management services to include: financial empowerment, emergency living funds, child care resources, and housing assistance. Provides affordable loans for energy efficient home improvements and repairs. Campbell Park Elementary School sits in the shadow of Tropicana Field in St. Petersburg and serves 646 children, 86 percent of whom are on the free or reduced lunch program. Several strategies have been put in place at the school. Parents’ basic needs are being addressed with benefits assistance, budgeting classes, back-to-school supplies and holiday gifts. Through our partner agencies, early learning and youth development programs are being expanded. Campbell Park Elementary serves 617 students (46 percent female). School grades: C school in 2009 – 2010 and 2010 – 2011 school years; D school in 2012 – 2013; F school in 2013 – 2014. 20 percent have a disability and 94 percent are economically disadvantaged. 0.1 percent are English language learners. 21 percent are suspended each year. 25 percent missed 21 or more days of school each year. Students are comprised of 85.5 percent African American, 16 percent white, 12.9 percent multiracial, 3 percent Hispanic, .01 percent Asian. 94 percent of students are in the free and reduced lunch program. Needs assessment identified that students lack role models, leading to poor outcomes for youth. Program funded by the Tampa Bay Rays. Religious Community Services: Provides resources/referrals for families attending school. Parents Getting Involved Program: Addresses the challenges of low parent involvement and increases parent advocacy for children; increases parent volunteerism for PTA and other opportunities as they evolve. Strategy 1: Work through the school system to meet parents’ basic needs and establish trust. Strategy 2: Implement strategies to assist parents in getting children safely to school. Strategy 3: Identify opportunities to expand evidence-based programs that support early learning. Strategy 4: Identify opportunities to expand evidence-based youth development, emphasizing programs that provide youth with role models.